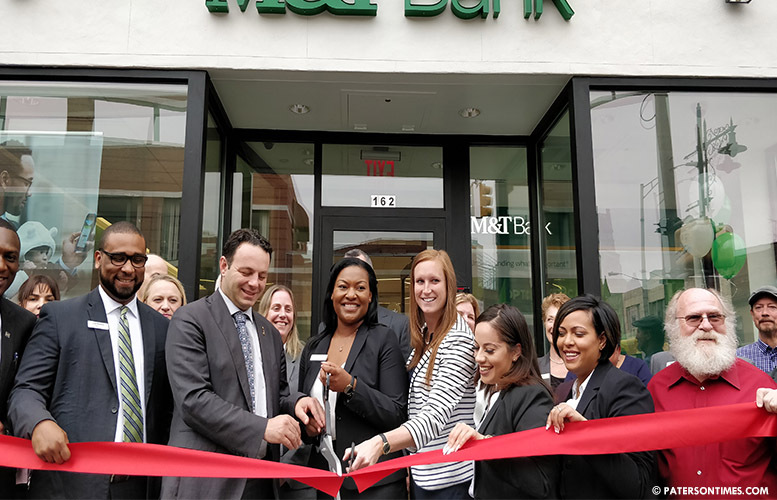 The city celebrated the opening of the new M&T Bank branch in downtown Paterson with a ribbon cutting ceremony on Wednesday morning. Mayor-elect Andre Sayegh welcomed the bank to the city. “You are enhancing the appeal of our downtown district. So, we’re very happy to have you. We welcome you with open arms,” he said. Sayegh recognized two of the branch’s employees – one as a Patersonian and another as one of his former students. The branch created five jobs in the city. Two were transferred from elsewhere and three were hired for the downtown branch, said Tifani Borel, branch manager. Borel said the bank’s free checking with no minimum and no service fee has been drawing new customers. She has had a positive experience in downtown Paterson since the branch opened on the corner of Main and Van Houten Streets in April. “It’s wonderful. The community is embracing us,” said Borel. Even before the opening of the new branch, M&T Bank had been contributing to revitalize the Silk City. Over the past two years, the bank gave $400,000 to $500,000 to the New Jersey Community Development Corporation (NJCDC) through the state’s Neighborhood Revitalization Tax Credit Program (NRTC) for the Great Falls Promise Neighborhood, said Alle Ries of M&T Bank. Some of those funds went into the center for young people on Front Street. The bank has issued approximately $75,000 in grants to different nonprofits in the city. It has worked with Paterson Habitat for Humanity, Eva’s Village, and St. Paul’s Community Development Center. “They have been extremely proactive,” said Jamie Dykes, president of the Greater Paterson Chamber of Commerce, referring to the bank’s outreach to both residents and the business community. The bank has a strong small business investment unit. Dykes said his members, mostly small businesses in the Passaic County area, will benefit from relationships with the branch. He has introduced bank officials to his members, he said. Dykes saw the bank branch as a welcome addition to the city’s main commercial district. will the homeless and vagrants be taking up residence in the vestibules in this bank also. after closing. like they do with all the banks in the city.that have a 24 hr. ATM machine.